Book Three of the Girls of Spindrift. From the New York Times bestselling author of the Flowers in the Attic and My Sweet Audrina series (now Lifetime movies) continues a haunting new series featuring highly intelligent teenage girls who struggle to survive a specialized high school and find their place in a world that doesn’t understand them. Mayfair arrives at Spindrift School, and quickly begins to feel its walls are a prison, its teachers her wardens. Having become best friends with Corliss and Donna, the three of them become the de facto It Girls of Spindrift; the other students call them the Supremes—and not for their singing talents. Jogging the grounds of Spindrift one day, the girls notices a hole in the fence leading to the nearby town that the students are never permitted to visit. 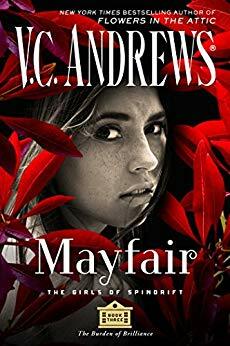 Gathering up their nerve for an off-campus excursion, they venture to a local bar, and into the presence of a man Mayfair becomes enchanted by. Thrilling and new, this affair of the heart is the opposite of the rigorous study Spindrift demands of i ..